One of the recurrent debates within the Occupy movement is whether it should adhere strictly to non-violent methods, or rather embrace a "diversity of tactics" (including, presumably, violent ones). This debate is futile unless it considers a deeper question: "Tactics to achieve what?" Without clarity here, the question of non-violence becomes a debate about moral philosophy. As I have written elsewhere, I think the purpose of the Occupy movement goes well beyond redressing inequities in income, employment, or debt. It seeks systemic change that is so deep that it is hard to put into words – especially the words of conventional political discourse. A world of justice, of peace, of healing – a world of love – is not something that can be demanded. For most of the protesters, such a world is not even yet a vision, but only a stirring in the heart. Yet neither is it mere idealism, for in time this stirring will generate visions that will crystallize into political and social action. The question for now, though, is how to act on a stirring of the heart that seeks a revolution of love. Because the change the movement seeks is not a change that can be forced, the tactics of force will not serve. Besides, even if it were conceivable to make war for love, the guardians of the status quo have forces vastly superior to anything ordinary citizens can muster. Not only is a revolution of love the only kind of revolution we really want, it is also the only kind of revolution that is possible. But if not force, what are its instruments? I propose two: to bear witness, and to speak the truth. These are not copout strategies that shy away from confrontation, conceits of the armchair pacifist. To the contrary, they require active participation and sometimes great physical courage. Ours is the civilization of an addict, addicted to debt, addicted to technological fixes, addicted to control, and applying more and more of the same to remedy their failures. You can't force an addict to change – if you try, either you fail utterly, or you drive the addiction underground only to come out in some secretive and even more damaging way. Similarly, most political revolutions fail, or end up installing a new 1% even worse than the first. Faced with an addict, what you can do is stop enabling his story of normalcy and instead speak the truth about his condition and bear witness to his actions. Then, at least, you can protect others and offer the opportunity for him to see himself as he is. To see the power of bearing witness and speaking truth, let us start small and consider the events surrounding the recent police brutality at UC Davis. In the clash between police and protestors, who came off the better: the police who used violence, or the students who linked arms and refused to fight back? Which side better achieved their goals? The police and the university administration were shamed and humiliated when the video of police brutality went viral, while the students received nationwide sympathy for themselves and their cause. I raise this point not to argue the case for non-violence, but rather to observe why non-violence worked there. That reason, in turn, illuminates how the movement might fulfill its true potential. The peaceful resistance of the UC Davis protestors was effective because of the ubiquitous presence of high-quality video cameras to record the event, and of social media to spread the recordings. Thanks to these technologies, the truth, unfiltered by corporate media, can reach millions of people, who all bear witness to what has happened. Police and their commanders will surely hesitate to spray seated protesters with pepper spray next time, knowing that they too will be unable to conceal the truth from the witnessing of the whole world. These are the powers – of truth and of witness – that will transform our world. They are not a substitute for other kinds of action, but rather their foundation and their inspiration. In our more heroic moments we might do the right thing when no one is watching, but human beings are social creatures; our consciences tend to frailty when not under the gaze of a community. Some psychologists would indeed reduce conscience entirely to socialization (the internalization of parental and social judgments). I would not go so far, but surely conscience is stronger when shame, fear of opprobrium, and desire for social esteem reinforce it. We all want to do the right thing, but sometimes we need a little help from our friends. Let's now take the issue beyond the dynamics of protest, for indeed we must not make the point of the protests the protests themselves. If the movement turns inward and becomes about itself (about the encampments, for example) then it will alienate itself from the public, which cares a lot more about economic inequality than it does about the right to camp at Zucotti Park. The primary purpose of the movement is not to establish the right to free assembly, although this is an important right symbolic of the desire to reclaim the wealth that should belong to all. Why did it assemble on Wall Street to begin with? There was no single articulated reason, but perhaps the unarticulated, unconscious reason was precisely what I have said: to speak the truth about what is happening to real people in this country, and to bear witness to the concealed brutality of the global system centered on Wall Street. The whole concept of "occupation" also invokes the power of witness. To occupy is to be present, and thus to bring consciousness to places – physical or figurative – that had been ceded away. Now we are reclaiming them. The physical presence of the Occupiers allows them to bring truths to public awareness, to speak the unspoken, because unlike words on a screen they do not go away without confrontation. The delete key doesn't work with physical occupiers. The truth they speak must be dealt with; unlike a one-day licensed protest, it won't just go away and cannot be ignored. That is part of the reason why the movement has succeeded beyond expectations, for example by dramatically increasing public awareness of the concentration of wealth. Never has the movement imagined it will be able to physically prevent Wall Street from going about its business. Rather, it exposes Wall Street to the light of scrutiny. It says, "You will no longer do what you do in secrecy." We are only able to continue our ravaging of the planet under the cover of pretense. How is it that we as a society take no action, when the awful artifacts of our way of life on this planet lay strewn all around us? How is it that we continue to hurtle towards an obvious abyss? It is only because we have been rendered blind and insensate. Underneath their numbers games, the banks and hedge funds are stripping wealth away from the masses and the planet. Behind every profit statement, behind every executive bonus, is a trail of wreckage: trip mines, debt slaves, pension cuts, hungry children, ruined lives and ruined places. We all participate in this system, but can do so willingly only to the extent we do not feel, see, or know. To conduct a revolution of love, we must reconnect with the reality of our system and its victims. When we tear away the ideologies, the labels, and the rationalizations, we show ourselves the truth of what we are doing, and conscience awakens. Bearing witness, then, is not a mere tactic, it is indispensable in a revolution of love. If love is the expansion of self to include another, then whatever reveals our connections has the potential to foster love. You cannot love what you do not know. Nearly everyone who sees the UC Davis video is sickened by what they see. So also, everyone who sees behind the veil of numbers is sickened by what our financial system is doing to the world. Let the purpose of the Occupy movement be to tear away the veil. Even if some of the perpetrators retreat more deeply into rationalization and denial, others will have a change of heart. More and more police will refuse to shoot, more and more authority figures will counsel restraint, more and more functionaries of power will quit their jobs, blow the whistle, or try to reform their institutions from the inside. What is power, after all? Every one of the power elite's overwhelming advantages – military forces, surveillance systems, crowd control technology, control over the media, and nearly all the money in the world – depends on having people obeying orders and executing their assigned role. This obedience is a matter of shared ideologies, institutional culture, and the legitimacy of the systems in which we play roles. Legitimacy is a matter of collective perception, and the Occupy movement is changing people's perceptions. Today, cognizant of the impotent flailings of the political class, we understand that deeper work is necessary before we can add more proposals or demands to the political froth. We need to change the climate, the basic mythology of our culture. It is not only the neo-liberal free-trade narrative that is bankrupt, not only the money system predicated on infinite growth; the crisis of civilization goes all the way to the bottom. Let us never forget what kind of world we are trying to create. Let us have the audacity to set our sights on a world of love, compassion, justice, and respect for all beings. Let this be our guiding principle, in strategy as well as in goals. And let us hold firm to it even when people in their cynicism or despair dismiss us as naïve and invite us to set our sights lower. Come on, folks. Are we really here to create anything less than the more beautiful world our hearts tell us is possible? Framing the purpose of Occupy in terms of speaking truth and bearing witness might offer the movement some clarity about its future direction and strategy. While it suggests non-violence as an appropriate policy, I am afraid it also implies the need for various kinds of civil disobedience, as well as transgressions on what is considered "private property." That is because in this country, there is very little public space: the street (mostly inhospitable to pedestrians) and a few parks. With the exception of college campuses and a few large cities, public life mostly happens in private buildings: shopping malls and Wal-Marts, for example. There is much truth to be revealed in such places, as there is at fracking sites, sweatshops, courtrooms, nuclear waste dumps, corporate headquarters... all are fertile venues for occupations. Occupation can exert a powerful effect on every level, for example when a handful of activists occupied the boiler room of an apartment building in Harlem to shame the landlord into repairing the heating system. Did they threaten the landlord's person or property? No. They just bore witness to an injustice. Action soon followed. The same, we might expect, will happen on a national, political level. 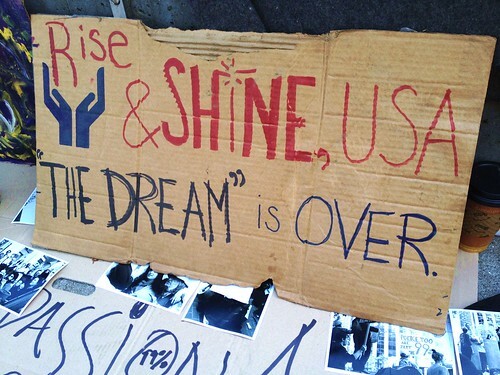 In two short months the Occupy movement has already shifted the political climate. As it continues to tell the truth and bear witness, that shift will accelerate, empowering actions and policies that would be considered politically impossible today. Contributing to this acceleration, the crisis of civilization will intensify, making the truth harder and harder to ignore. Perhaps humanity is ready to hear the wake-up call. Thank you Charles for the great way you articulate the many crises of capitalism and the way we can create the much more beautiful world our hearts know is possible. I was at Zuccotti park during September 2011 and I am now wondering how to be involved and really contribute to the movement in a way that will actually affect change.in the system. Any recommendations? Could you point me to organizations, communities or even other articles where oh address this inquiry? Thank you and bless you so much.